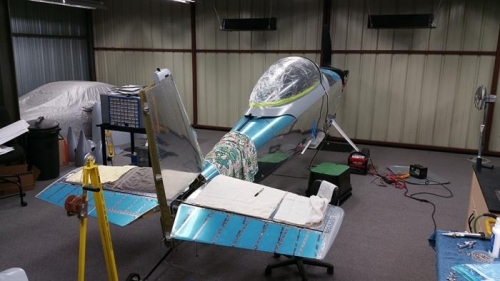 The RV-8 fuselage got moved out to the hangar on Friday as did two pickup truck loads of accessories and all of the tail pieces and a bunch of misc tools and what not for the final assembly. Saturday saw most of the tail installed. The process took longer than expected because the two rows of rivets along the fuselage under the horizontal stab somehow didn't get riveted. Also had to tap the empanage fairing holes. All that took longer than expected, but came out very nice. 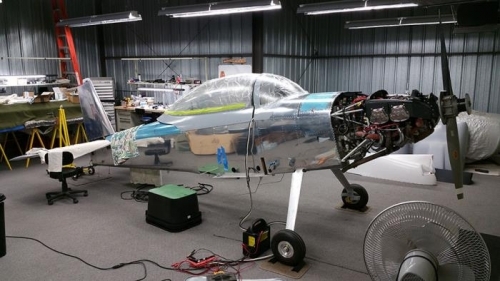 So all that's left on the tail is to reterminate the wires for the rear strobe and position light, mount the rudder, and connect the tailwheel linkage. It's starting to look like an airplane! Sunday should see the tail finished, brakes bled, wings installed and bolted on and maybe the floor boards reinstalled. Getting so close now! The test flight is just a few days away!